Educational, Nature Displays & Festival Souvenirs!! The one-stop spot- to learn, to eat and to play, all under one WARM & DRY roof. Don’t miss the fascinating educational, environmental & nature displays a variety of “green” organizations. FESTIVAL SOUVENIRS – postcards, jewellery, leather work, Christmas ornaments, key chains, stuffed eagles, mugs, toques, buttons and more! 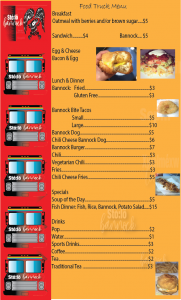 NEW this year the Sto:lo Bannock food truck will be on site. Click the photo below to see the full menu. Are you an Exhibitor interested in a display/product sales?